Easily add a new look to your home with this perfectly versatile medium blue drum shade. Lustrous satin is paired with a detailed silver gray trim and matching liner for a delightfully dynamic design, plus a convenient chrome spider fitter that makes it easy to refresh your favorite lamps with color and elegance. The correct size harp is included free with this purchase. From Brentwood Collection™. - Medium tone navy blue drum shade. Satin polyester material. - From the Brentwood Collection™ brand. - Silver piping trim detail along the top and bottom. - Chrome finish spider fitter. The correct size harp is included free with this shade. 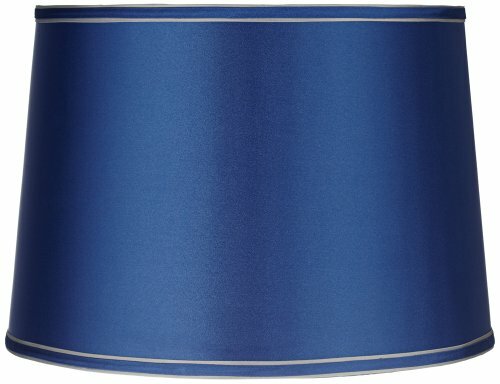 Medium tone navy blue drum shade. Satin polyester material. From the Brentwood Collection™ brand. Silver piping trim detail along the top and bottom. Chrome finish spider fitter. The correct size harp is included free with this shade.